First Second is very proud to present Nursery Rhyme Comics. 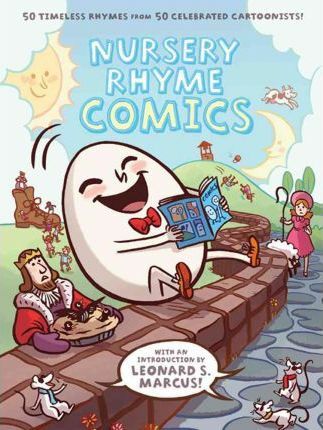 Featuring fifty classic nursery rhymes illustrated and interpreted in comics form by fifty of today's preeminent cartoonists and illustrators, this is a groundbreaking new entry in the canon of nursery rhymes treasuries. From New Yorker cartoonist Roz Chast's "There Was a Crooked Man" to Bad Kitty author Nick Bruel's "Three Little Kittens" to First Second's own Gene Yang's "Pat-a-Cake," this is a collection that will put a grin on your face from page one and keep it there. Each rhyme is one to three pages long, and simply paneled and lettered to ensure that the experience is completely accessible for the youngest of readers. Chock full of engaging full-color artwork and favorite characters (Jack and Jill! Old Mother Hubbard! The Owl and the Pussycat! ), this collection will be treasured by children for years to come. Nick Abadzis; Andrew Arnold; Kate Beaton; Vera Brosgol; Nick Bruel; Scott Campbell; Lilli Carre; Roz Chast; JP Coovert; Jordan Crane; Rebecca Dart; Eleanor Davis; Vanessa Davis; Theo Ellsworth; Matt Forsythe; Jules Feiffer; Bob Flynn; Alexis Frederick-Frost; Ben Hatke; Gilbert Hernandez; Jaime Hernandez; Lucy Knisley; David Macaulay; Mark Martin; Patrick McDonnell; Mike Mignola; Tony Millionaire; Tao Nyeu; George O'Connor; Mo Oh; Eric Orchard; Laura Park; Cyril Pedrosa; Lark Pien; Aaron Renier; Dave Roman; Marc Rosenthal; Stan Sakai; Richard Sala; Mark Siegel; James Sturm; Raina Telgemeier; Craig Thompson; Richard Thompson; Sara Varon; Jen Wang; Drew Weing; Gahan Wilson; Gene Luen Yang; Stephanie Yue; and an introduction by Leonard Marcus.